Paris at night is beautiful with dazzling lighted streets, bridges, and buildings. But that’s not why Paris is called the City Of Lights. Its fabulous art and Intellectual creations contributed to that distinction as much as anything else. Paris at Night – Why All the Lights? Paris is beautiful during the day. However, don’t underestimate its amazingly diverse nightlife and the after-sunset beauty of Paris at night. Paris, the City Of Lights, has something quite special compared to most cities. The reason why it got its nickname is the mix of physical and intellectual beauty, you can find here. Just for a moment, let’s forget about the physical aspect. Paris has a very rich intellectual history and was originally called ‘La Ville-Lumière’ because it was the birthplace of many inventions and the center of education across Europe. As it turns out the French aren’t only great chefs but also inventors extraordinaire. The two may even blend together as they invented mayonnaise in 1756 and the process of pasteurization in 1864. If it weren’t for French inventors, we wouldn’t have so many of the conveniences and necessities we take for granted. From the complexity of the Metric System to the simplicity of the Pencil Sharpener, and everything in-between. Braille, the ambulance, the stethoscope, the hairdryer, the metronome, and the mongolfière, or hot air balloon. And it didn’t stop there. The accomplishments diverged into significant creations by poets, authors, engineers, and philosophers. Even today Paris is rich in the arts such as “allumettes une à une allumées” or Paris At Night a poem by Jaques Prevert. Do you know what city was the first one to have street lighting? You guessed it! Paris is the OG when it comes to this matter, as it had street lighting before any other city. We can argue about the reason for that. Maybe all the inventors who needed more time and light to keep up their good work? That is, however, just speculation we like to mention to people. The combination of the intellectual drive and physical beauty in the city secured it its name in history. The City Of Lights – ‘La Ville-Lumière’. We have talked about the intellectual part of the City of Lights. Now, let us focus on the physical beauty of Paris at Night. Your jaw will drop before the shine and grace of the French capital! Do you plan to visit this amazing city as a tourist? Do you come here to expand your travel web or blog? Prepare yourself for many after-the-dark excursions through the luminous streets of the City of Lights. Let’s dive into all the options you have when scrolling down Paris at night. Eiffel Tower opened in 1889 and this year it will celebrate its 130 anniversary. What better opportunity to visit it than on its birthday? During the night the Tower lights up with over 20 thousand light bulbs. And you can see that from over 50km away! Isn’t that crazy? You don’t have to go that far thou. The best spot to see the Eiffel Tower from far is Les Ombres. Fair enough, this view might be a bit too fancy for some as the dinner menu goes up to 70€. However, if you’re not afraid to pay for this unforgettable experience, definitely try this one. For on the budget views, try one of the bridges – for example, Pont Alexandre – on the Seine. You can even get surprised by the view from one of the surrounding streets – like Avenue de Suffren. 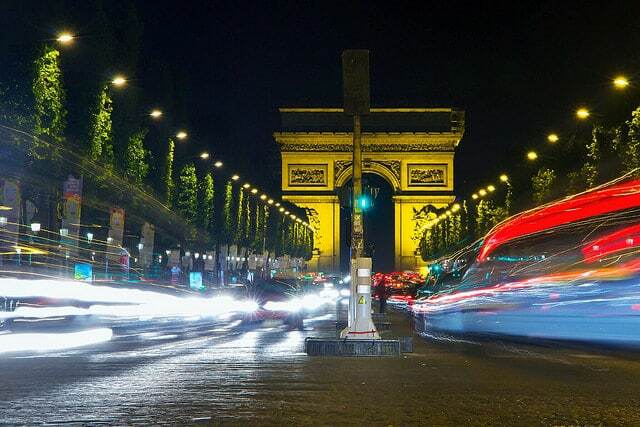 Another must, when it comes to visiting the City of Lights at night, is Avenue des Champs-Élysées. This almost 2km long street is famous for all its luxurious shops, cafés, theatres and restaurant. It is up to you whether you decide only to take a walk or to sit down in one of the five-star restaurants for a fancy dinner or a drink. Either way, the glowing street of Champs-Élysées will take your breath away as you scroll by it. What’s more, every once a month, the street is made completely pedestrian! That means you can enjoy this amazing walk without any interference and take the best pictures of the Arc-de-Triomphe. The third mesmerizing place to see during the night is the Louvre Palace and Museum. The glass structure of the museum reflects all the lights surrounding the space. By the way, did you know that the museum is opened until 10 pm? That means you can enjoy the museum during less crowded hours. Then take a night walk around the Louvre complex. You will be dazzled by the moon reflecting on the Pyramid of Louvre. Experience Paris Latin quarter at Night with people from all around the world and turn strangers into friends, and explore the parisian Nightlife.